Our stylists are trained by Aveda and other Global Masters. Our master stylists have over 20 years of experience in salon education, while our new stylists participate in continual education in the latest practices. We’re always looking for bright, creative talent to join our team. Interested in working at one of the most dynamic salons in the city? Want to join our team? Contact us at contact@terramatersalon.com. We're always on the lookout for bright, creative talent. 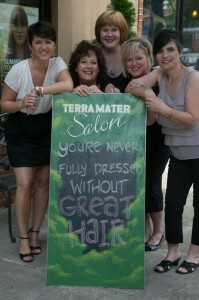 Call us or e-mail contact@terramatersalon.com.